i'm not quite ready for fall to be over, but the weather feels like winter's coming quick. reminds me that i haven't started on my christmas card yet, i really should figure out what its going to be so i can start producing - it always takes me a bit longer then i think it will and i have a longer list this year too. 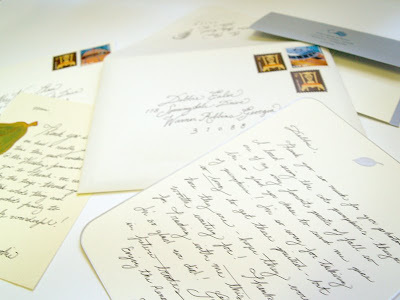 I just love seeing handwritten letters and notes. Will you possibly use that pearlized linen finish for your Christmas cards? too late for this years! perhaps for next year's card - if i can wait that long to use it!